If you are a skier, who watched in the high season that your favorite runs in the resorts get tracked quicker than ever before, here’s why you might want to start climbing. Some of the ski resorts in lower elevations of the Austrian Alps closed for the season this past weekend. To some riders, it meant the end of the snow season, but to some others, it’s hard to let go if that the conditions are still prime up in the glaciers. 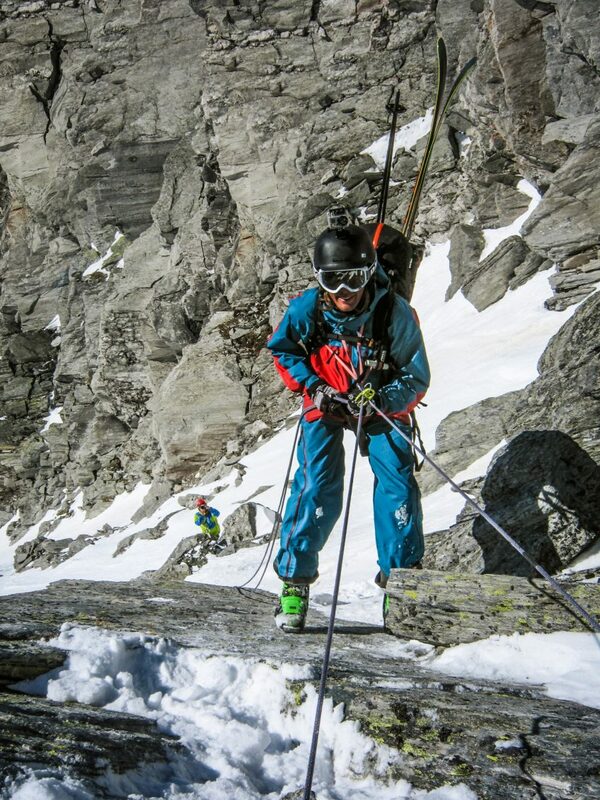 Taneli’s first short rappel into the Tuxer Banana couloir using a makeshift harness made of two simple slings. The rise of out of bounds riding has been very quick. In just less than 10 years, we’ve come from seeing the first skis that got really fat to acknowledging that every second teen in your chair lift now has got a pair that will float them on pow. And no more can skiers make jokes of snowboarders as slow touring machines, as they’ve got also the split boards to hike further for untouched snow. Competition – a lot of competition for snow. There are however a couple of things that make a free rider’s chase for the finest turns easier, and the key is in confidence in moving in exposed terrain and confidence in using the gear that is needed to access such places safely. This is where climbing comes into play. You don’t have to send the toughest boulders, climb the hardest routes, or traverse the most exposed ridges. You can learn the necessary rope handling skills, belaying & rappelling techniques, knots, hardware, and simply trusting all of that on fairly easy routes. As things stand these days, many people start climbing in gyms, and that’s a great way to start learning for a longer journey. Gyms may even be called “labs”, where adding one new factor at a time is easy. First, you go bouldering with friends, then climbing taller routes that might initially trigger vertigo in you. Get used to the heights and build up the trust on the safety set-up: harness, rope, carabiners, belay device, and the fellow belayer. Take the falls, and learn to know that everything that’s there for you will catch the fall. This is not what you want to learn on a steep slope – you want to feel prepared and confident there. Alone the simple knowledge to rappel might let you sneak in a place that was previously a no-go. 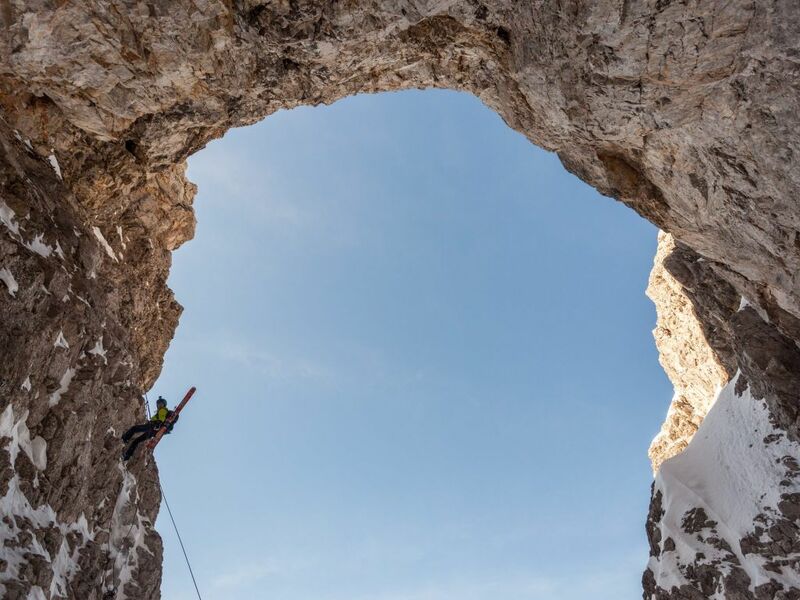 If you’re an experienced skier or snowboarder and want to take that next step into the terrain that you’ve only watched in awe from afar, use the coming off-season to train yourself into the sport of climbing and be ready to hit the steeps next winter! Note that glacier travel and crevasse rescue is something that you won’t learn in gyms and shall certainly be trained separately. Add that skills set and you add again a whole new playground. We at Kitka Climbing want to play it fair and put the credit where the credit is due. This time the kudos goes to Lorenzo Rieg for his image of Juho Karhu above. For anyone, who wants to follow Lorenzo’s trails in Tyrol, we recommend his book Powder Guide.